How to get aggregate WebApiAdaptor enabled Grid? Usually, remote data handlers like WebAPIAdaptor, return only the current page records which is the default behavior. So, we can summarize the current page records only in the Grid Summary Footer. The concept behind this adaptor brings the records on demand which means client-end receives only the current page records. Based on the received records only this adaptor summarizes the aggregates and displays them in Grid. If we return whole records to the client-end, concept of the load on demand will be declined. Henceforth, based on the current page records the summary were displayed. However, we can overcome this behavior using the custom adaptors and custom headers of the DataManager. Using the custom headers, required aggregate fields were shared to the server-end. Based on that selective fields with their records were returned to the client as aggregates along with the Items/count which will display the summary for total records. Define the Load and ActionBegin events of the Grid along with the customAdaptor. In the Load event, assign the newly extended adaptor to the Grid’s dataSource. In the ActionBegin event, lookup the model.query for aggregates and push them to the custom headers of the dataSource, an ej.DataManager instance. In the server-end, retrieve the pushed aggregated values and deserialize them to List<string>. Use the deserialized object as input for DataOperations for selecting the aggregate columns. Later, return them to the client-end along with the Items/Count wrapped object. Note: To avoid the serialization error only, WebApiAdaptor is prevented the default aggregate records returning from server-end. But this KB, proposed a way to generate aggregate for total records. It may lead to the serialization error in the case larger record count. Figure. 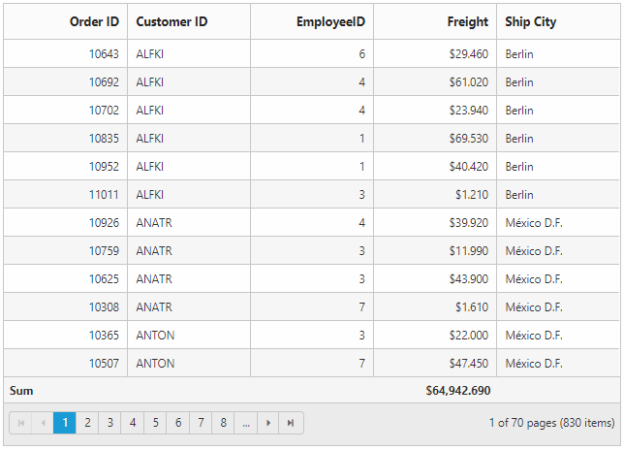 Grid with summation of total records for Freight Column.